Are your door locks becoming harder to use? Stiffening up or are you struggling to even put the key into the lock? If so, then this is a sign of either an old lock that has seen better days or a badly made cheap lock that was never fit for purpose. Either way we can help. At Access we only supply the best quality locks and when we install your locks for you, you can rest assured that they have been fitted by a professional who has the experience to make sure your new locks last for years to come. 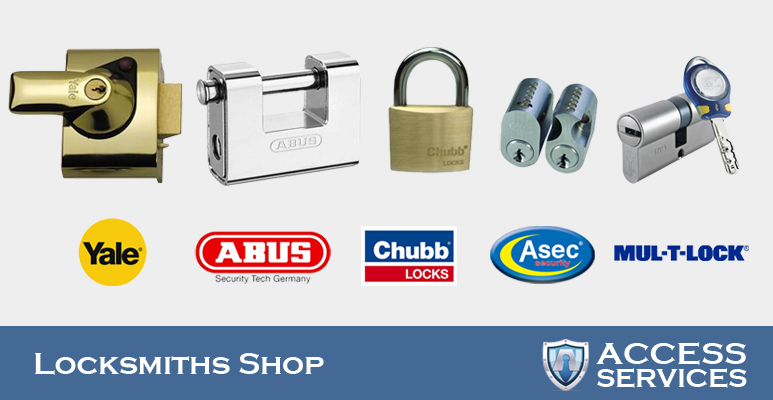 The new locks we sell include Yale, Abus, Chubb, Asec and Mul-T-Lock. These brands have all been tested to ensure their quality and strength. After all, you buy a lock to keep something safe and keep unwanted intruders out so you need to make sure it has been made by a quality manufacturer that understands the needs of their clients. At Access we highly recommend that you opt for one of our quality branded locks over a cheap competitors lock as we know that a safe lock makes a safe home. Too often we hear of people buying new locks from the internet where the locks can be up to half the price but be warned, these locks are not made to the same standard and often need replacing within a year or two! Don't cut corners on items such as locks just to save a few pounds. Buy you locks from your local locksmith in Salford, Access Services and have the peace of mind that your locks will last. Remember, buy cheap door locks, buy twice! Come down to our Salford locksmith shop and have a chat with a member of our locksmith team. We can give you friendly, sound advice on the best new door locks to choose for your specific situation and always give competitive prices to trade customers and the general public.